Life at San Valiente Luxury Apartment Homes will surpass your expectations. 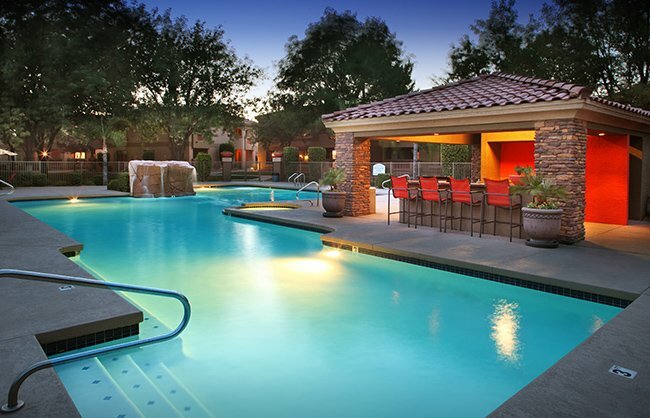 Our luxury one, two, and three bedroom apartments in North Phoenix, AZ, have been thoughtfully designed to enhance your lifestyle. As soon as you step into your air-conditioned apartment you’ll feel at home. Lofty 9-foot ceilings add style and space to your home, and your private balcony or patio extends your living space into our beautifully landscaped grounds. You can live the good life without ever leaving our community. Relax in our sparkling resort-style swimming pool, or work up a sweat in our spacious and newly renovated fitness center. Our onsite volleyball court and resident clubhouse are great places to meet with friends and neighbors. And your pet will feel right at home at our onsite dog park, where you and your pup can get some energy out at the end of the day.